Mom's Musings: Passing with flying colours!! We had decided to have a g-tube put into her stomach and this would free her up to come home earlier then later. So, on Friday she was scheduled to have a GI study done, to make sure everything inside was in the right spots and it was all functioning fine...and she passed that one with flying colours. Then we were hoping for a surgical spot over the weekend sometime, but because it is an elective surgery, we were bumped both days...which was fine, she had a nice visit with grandma and grandpa instead. We made it there with enough time for Pete to hold her for 5 minutes and me to hold her for 5 minutes...during those times, the phone rang and the wheels were set in motion for her to be transported to the OR and have this procedure done. We watched as they wheeled her down that extra long hallway...it was gut wrenching...Pete kept saying that we really watch too many of those hospital reality shows...you know the ones called 101 Things Left Behind...anyhow, it was difficult and we were both on the verge of tears as she was getting farther and farther away. We knew that when she was out of surgery she wouldn't be awake and would need to be kept quiet and sleeping as long as possible, so we just went home and phoned later on when we knew it would be done. This morning when we called they said she was still on the machine. I was a bit upset and worried again, but when we got there, the tube was gone. 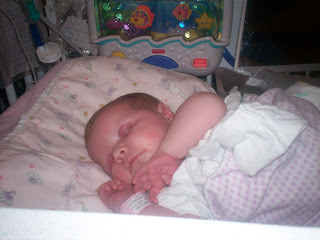 We asked our nurse about it and she said that Faith had told her, when the nurse had pricked her heel to get bloodwork done, that is she was going to prick her then she bloody well should just take the tube out too...and with that, Faith threw her head back and got rid of her breathing tube...again. Already with her own mind...she will fit right in!! We did get to hold her today and snuggle with her, we also each had a turn feeding her. They are just starting her on Pedialyte for the first few feeds, then she will go back to milk. Now, we just hook the syringe onto the end of tube and hold the syringe at a certain level and the fluid just flows in. It goes through a lot quicker then the nose tube...which is nice, but we also see some stuff that we will have to get used to...I will not go into details...to save my readers stomachs!! Anyhow, the nurse told us today that maybe by the weekend, she will be transferred to our local hospital where we can get to know the team that will be working with us here in town...and not only that, but she will go to the general pediatrics floor...which is even better then staying in the NICU!! So, today has been awesome for everyone and we are now heading down that final road, I think...and here is a pic of Faith's beautiful face...wire and tube free!! FINALLY!! Oh Ruth! She is just beautiful. How wonderful to see her face free of all those tubes. What a fighter you got there! She is a gorgeous little girl, I can't wait to see her again - Em's is looking forward to seeing her at church! Yeah!!! God is good! C keeps asking me when Faith will be home. She look so peaceful.